The Circle of an Engagement is just that – a circle, or the letter O – and just like a circle, engagement is an infinite loop. And, as we will see, the circular motion is made of the three processes: Scatter, Gather and Matter. Scatter is the beginning of engagement, the outbound part where someone or something puts out a message. Gather is about how people then respond to that message. Finally, Matter is about taking what has from gathering, and turning that into a lasting resource. The Matter process then feeds back into the Scatter process, the same way that the seed is in the fruit in the farming analogy above. 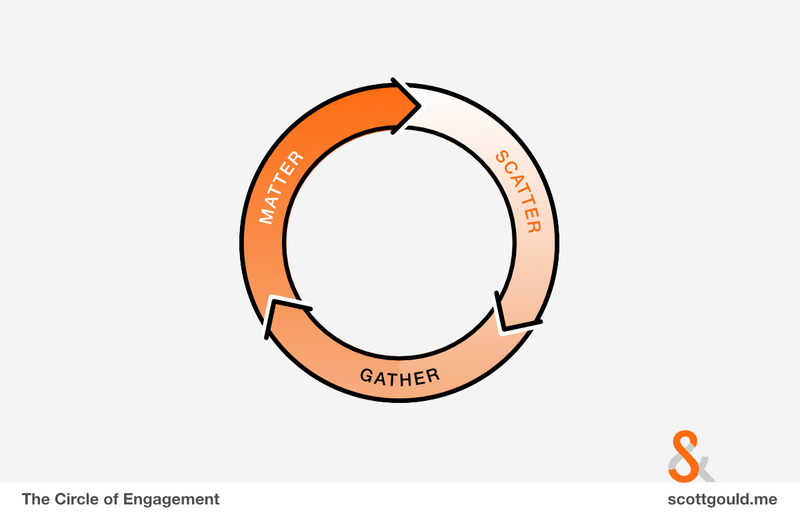 These three processes, Scatter, Gather, and Matter will be a constant thread throughout each framework because they are how all engagement happens, whether it is with communities or customers, whether it’s personal or professional, and even down to the way you’re interacting with this webpage, right now. I’m sure you’ve got the idea here. You’ll likely recognise the biblical origins of the first example, no doubt see yourself in the second example at times (whether you’re a LOTR fan or not! ), and I don’t need to tell you that Facebook is the third example. These examples describe the Circle of Engagement and the three inexorable, irreducible, irrefutable processes that comprise it.